I am a member of the Friends of Grovelands Park and I attended a general meeting this week. This year was Grovelands Park centenary and hundreds of people attended the celebrations in the park to make it a marvellous success. I am surprised that there aren’t more members of this group to support and maintain this historic park. If you want to become more involved with the park and the Friends of Grovelands Park, they are actively seeking more members. Annual membership is £5 and their website is here http://www.n21.net/friends-of-grovelands-park-winchmore-hill-n21-london.html. The next meeting is Thursday 21st November 2013, 8pm at St Paul’s Church Hall. At the FoG meeting we heard about Travellers being evicted from Edmonton and actively looking for a new place to set up in the Enfield area. I had a traveller knock at my door and ask if I wanted anything sharpened the day before the meeting. Does anyone get anything sharpened on their doorstep by gypsies anymore? Or is it a tactic to check whether anyone is at home? I didn’t feel safe. 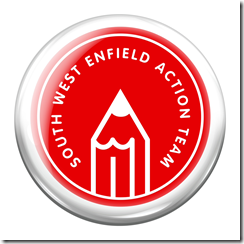 I had to speak out at the FoG meeting about SWEAT (South West Enfield Action Team) and our campaign. I clarified what we are trying to achieve and also what Enfield’s current proposals on the land adjacent to Grovelands are. The majority of FoG members have an open mind about the Grovelands proposals, I think that is because we are all waiting to see whether English Heritage says the concept is viable. To help muddy the waters there have also been rumours about a housing development on the site.I am definitely against a housing proposal for this site. Three new family homes have just been built directly opposite the Grovelands Park entrance on Bourne Hill with no consideration given to where the children will go to school. Nowhere! They will be like us, desperate! I don’t blame the objectors for not wanting change but I think they are being naive if they think that nothing will change. It may not change this year or next but it will change. Perhaps they will be happier with Travellers moving onto this empty site and enjoying the natural beauty? Or perhaps they prefer it to be a secondary school, which will be the next problem in a few years time? Or will they be welcoming new neighbours when it becomes housing? Don’t blame me I am only the messenger … at the moment!